This spring we caught a swarm of bees with our bait hive. Congratulations! You've decided to become a beekeeper! But wait. THE BEES! The most essential part of beekeeping! Where do you get bees? And how can you make sure those bees are healthy? A bait hive is a clever & smart way to get free bees that are *also* healthy bees. Bees are valuable and can cost a beginning beekeeper up to $150 for a starter colony (called a nucleus, or nuc). Bait hives & swarm traps provide a temporary home for a swarm of bees. That's right. You can catch a swarm for FREE by setting out a bait hive! Or you can mail order a nucleus of bees (a mated queen bee and 3 pounds of worker bees) from across the country for $150+ USD. Personally, I prefer free bees. A bait hive lures a swarm of bees into a temporary home. This home is lightweight, can be placed anywhere (unlike a full hive), and has all the things bees are looking for when they are shopping for a new home...space, light, positioning, it's air-tight, and untreated on the inside. Once they move in, you then can settle them to a full-sized hive. It's recommended that beginning beekeepers manage 2 hives their first year so you can compare to see if they are healthy, normal, or need some TLC. With a bait hive, you can catch 2 or more swarms (once it's empty, it can be re-used again and again) and save yourself up to $300+ your first year. Local swarms of bees have a great mix of genetics you won't find anywhere else. Bees that are swarming in your area are called "survivor bees," or bees that are acclimated to your specific environment. For example, our hive of bees was rescued from a rotting California Oak tree. The bees were a local swarm that had become nuisance to the homeowners when their crowded, heavy hive caused a limb to break and spill sticky honey everywhere. Once they were relocated to our backyard Langstroth hive, they had space to thrive. In fact, we soon realized they were perfectly adapted to the drought conditions of California and were incredibly productive during our hot summers. Within a few months our very docile swarm of rescued bees had filled enough honey for their winter stores (20 deep frames of brood, or babies, and capped honey) and had moved up into the supers. We got to enjoy our harvest a year earlier than expected. NOTE: Not all swarms are meant for urban beekeeping. If you suspect you've caught an aggressive swarm with a bad attitude, please call in a professional to remove them so they don't become a nuisance in your neighborhood. 3. KEEP THOSE BEES BECAUSE YOU'RE...A BEE KEEPER. Happy bees, happy little beekeeper. Bait Hives help you keep your bees on your property, even after you've already moved your swarms into hives. "Losing bees" or "Watching all your hard work and money fly away" is a huge bummer for any beekeeper. A bait hive helps entice swarms to stay on your property. Our first season, our hive decided to swarm despite all the usual precautions (giving them more space, splitting the hive, etc.). The swarm moved 40 feet up into my neighbor's tree. When I finally gathered the courage to knock on their door, I very timidly explained, "There's no reason to worry, I just wanted to let you know that 15 pounds of bees are hanging out in your backyard." My neighbors patiently waited for the bees to leave their tree a couple days later when I finally set out a bait hive / swarm box. It turned out really well, but it could have gone all kinds of bad. Most neighbors would have complained (rightfully so!) and we would have had to give up beekeeping. Or we could have lost a really healthy swarm because our neighbors decided to exterminate the bees rather than wait for them to move. If we had put out a bait hive, it would have helped decreased the chances of a swarm ending up in our neighbor's yard. What happens when a swarm moves into an electrical box. Luckily, the owners called Deb from GirlzWurk to remove them rather than kill the swarm of bees. A Bait Hive prevents a swarm of bees from being exterminated by providing an appropriate place for them move into. Bees get very creative when they can't find a spot, and for the sake of survival will move into the walls of a building or even a cable wiring box (see above). This is how bees can become a nuisance and are quickly exterminated with a can of bug spray. By placing a bait hive, you're providing a home to homeless bees that may / may not be from your local area. Placing a bait hive helps keep bees alive. 5. I WANT A BAIT HIVE! I WANT A SWARM TRAP! WHERE DO I GET ONE? Modern Hive bait hives are perfect for urban beekeepers. They have a 40L capacity, easy to remove lid, and a clean design. Bait Hives can be made cheaply out of scrap wood. You can google "Swarm Trap" or "Bait Hive" for directions. If you'd like to make your own, I created a tutorial where you can build your own Midcentury Modern Bait Hive. You can even buy disposable bait hives made of cardboard for about $40 to $175+. If you are an urban beekeeper, do yourself and your neighbors a favor by using a bait hive that is effective and attractive. You're now a bee ambassador and an important part of that is maintaining a good relationship with those who live around you. Beekeeping in our dense urban areas means your bait hive will be highly visible. 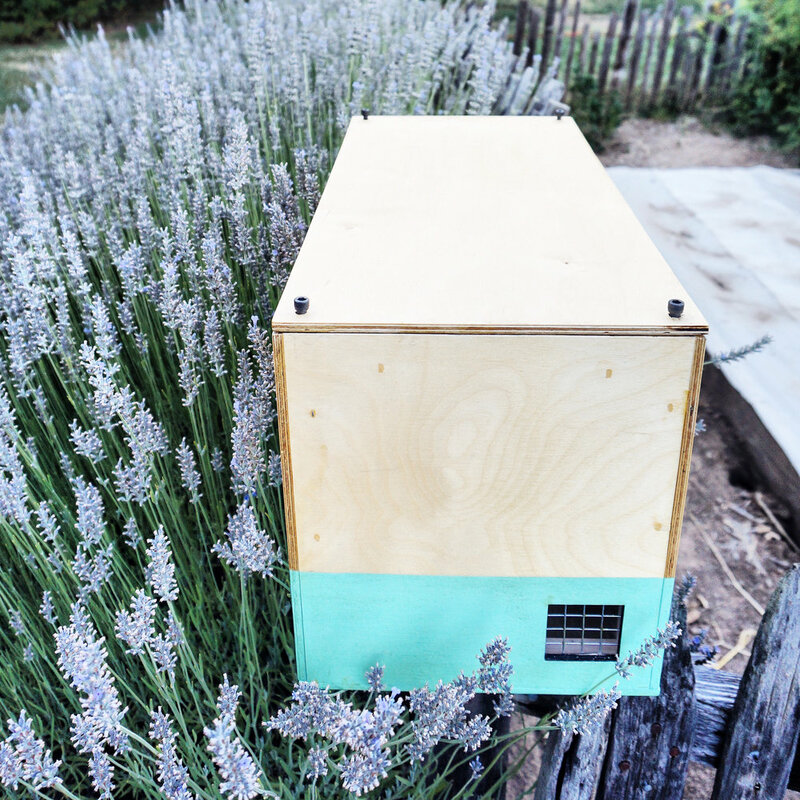 If you're not inclined to make a box, Our Modern Hive Swarm Boxes are attractive, and they are built to the recommended specifications of Thomas Seeley's research at Cornell University on Bait Hives. A bonus: Because they're reusable, they will become more attractive to bees the more swarms that you catch since it will begin to smell like "home" to bees. This month, our Modern Hive Swarm Boxes / Bait Hives are $110 dollars. The first 10 customers can purchase these boxes at this rate before they go back to their regular price of $145. Grab yours now at the Modern Hive Shop. Good luck catching bees! And continue to Bee A Keeper! !